Nigel started drawing as a relatively junior officer in a training organisation, as he needed to produce some essential visual training aids - for some potentially dangerous equipment - that should have been provided officially! He soon progressed to pen and ink and then pen line and wash. Many years ago he was attracted to watercolours, and started, as so many do, by buying a DIY book, in his case, Alwyn Crawshaw’s “ Learning to paint in watercolour”. By buying the recommended equipment and by following the exercises, he achieved pleasing initial progress, until work intervened. After a lengthy gap due to his busy lifestyle, he returned to watercolour, but rapidly hit a plateau in his progress. So, he developed his skills by learning more formally about the landscape, sky and trees over several sessions in the Lake District with Keith Fenwick, and followed this up by studying the medium and subjects in more detail with the late, renowned Bob Kilvert. Having attended a number of the Weobley Courses as a student, he was invited to join the teaching staff, and became a regular tutor for several years. He ran two of Bob's week-long courses ("The Sketchbook Week" and "The Castles Week”) each year until Bob’s retirement, taking leave to do so. These courses concentrated on teaching students how to approach landscape subjects such as buildings, trees, recession, water, and castles, demonstrating suitable techniques in the studio, which were then followed by practical tutored lessons on location. So he understands all the stages of learning, and has structured the approach to be suitable for all. He is also fully qualified to teach at the Further and Adult Education level. Upon his retirement he decided, in amongst other things, that it was important to spread this highy effective approach to teaching Watercolour, and has become one of a small group of people around the country who "spread the word” in this way. In addition to teaching, he has taken part in Hereford Art Week several years runnning, and successfully took part in the Big Art Show at Shrewsbury in July again this year as a demonstrator. 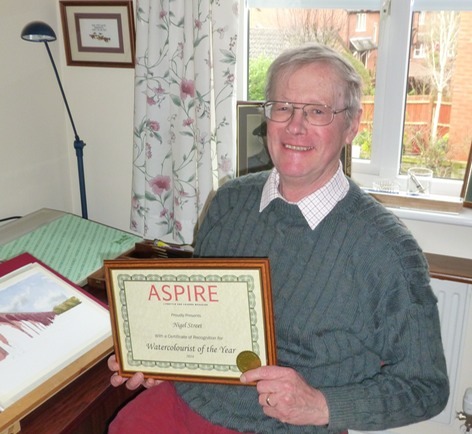 He was awarded Aspire Magazine’s certificate as Watercolourist of the Year in early 2014. See the magazine article here. He is also a member of the new Ross Market House Art Collective, “Made in Ross" that opened as an Arts and Crafts venue in the centre of Ross on Wye in May this year. His work may also be seen at Forge Framing and Gallery in the Craft Centre in Hay-on-Wye.